This bracelet is made on expandable wire and has a mix of indigo, sapphire and royal blue. The faceted and smooth jade along with the Swarovski crystals are complemented with rhinestone rondelles. The bracelet has a silver-plated lobster clasp and chain extender. It can be extended from 6 3/4 to 8 1/4 inches. This lapis blue faceted jade beaded ring is wrapped with silver-plated non-tarnish wire. The.. These earrings feature semi-precious carved flower beads that are linked to sterling silver oval-s..
Do you love to wear hoops and the color blue? These earrings have a blend of dark and light blue f.. Treat yourself to these blue dangle earrings. 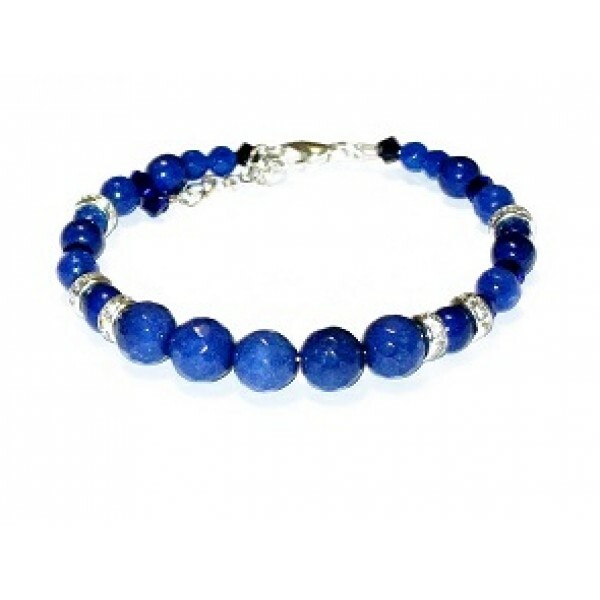 They contain mother-of-pearl beads, faceted jade and.. The semi-precious carved flowers featured on these hoop earrings are complemented with Swarovki cr..